Mont Saint-Michel is a formidable-looking island made of granite, jutting out of the North Atlantic, about half a mile off France’s Northwestern Normandy coastline. The island encompasses 247 acres and is 3,150 feet around and 302 feet above sea level. 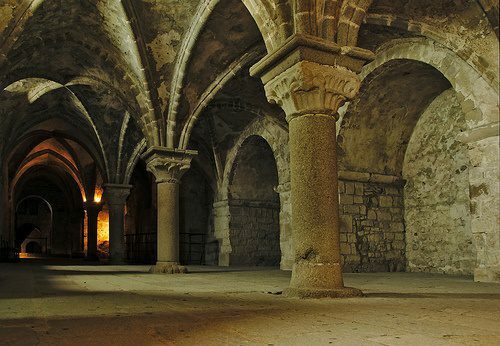 It’s famous for its 11th century Romanesque Abbey Church perched atop the Mont, along with monastery buildings, cloisters, and a refectory that were added during the following 2 centuries. It was named a UNESCO World Heritage Site in 1979, recognized for its historical and cultural significance. Each year, over 3 million tourists and pilgrims visit this landmark. 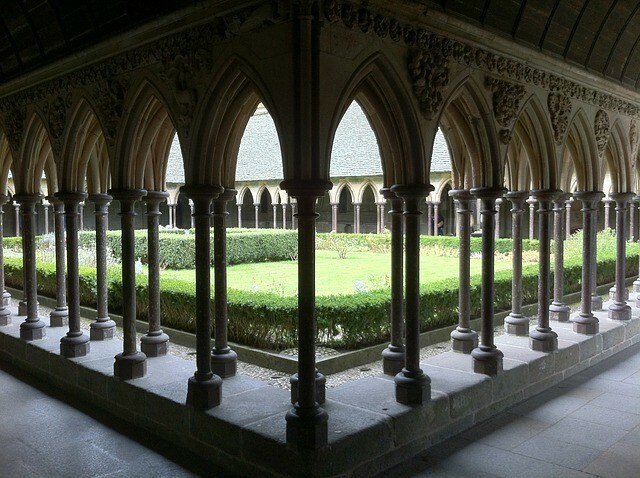 Strolling quietly along the covered hallways and looking in on the Cloister garden. 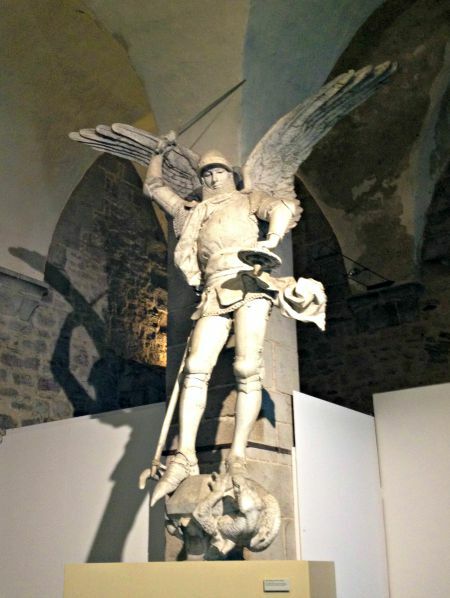 Well, apparently, legend has it and believers believe the Archangel Michel appeared to St. Aubert in 708 telling him to build a church on Mont Saint-Michel, which was then called Mont Tombe. It appears St. Aubert didn’t take the request too seriously until St. Michel returned a second time and burned a hole in St. Aubert’s skull with his finger. Yikes! Well, that lit a metaphorical fire under St. Aubert! He wasted no time and a church was opened on Mont Tombe on Oct. 16, 709. What you see today on Mont Saint-Michel was built between the 11th-16th centuries. 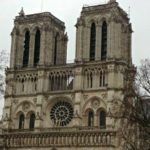 It began when Richard II hired an Italian architect, who designed the abbey with the 4-way crossing, typically near the altar, where the main aisle ends, to be at the top of the Mont, instead! Numerous chapels and crypts are under the abbey and used to brace the upward-rising structure. Did you know? 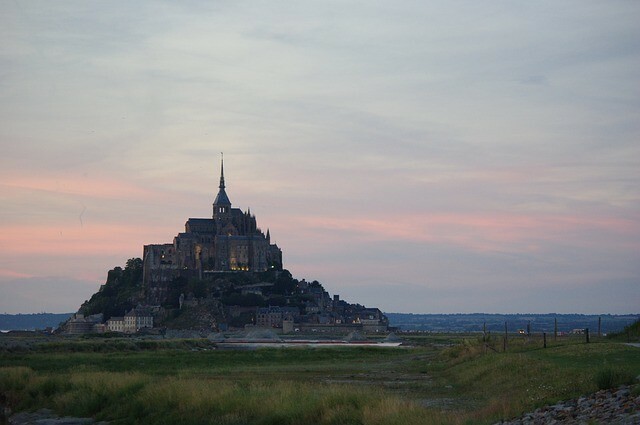 Mont Saint-Michel was the inspiration for the design of Minas Tirith in the Lord of the Rings: Return of the King. Of course, visitors come to admire the architecture of the Abbey and its church, cloisters, and grand chamber. It’s hard to miss the imposing church spire reaching toward the clouds! The main street leads you directly from the entrance to the Abbey stairs! But, why not go beyond street level and discover a few of the reasons why Mont Saint-Michel is so spectacular. 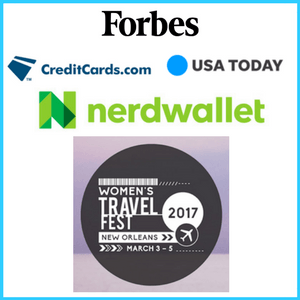 Pin this post on your Pinterest travel board! Mont Saint-Michel is steeped in history (excuse my shameless pun). There have been numerous attempts to conquer the Mont and use it for its strategic position. 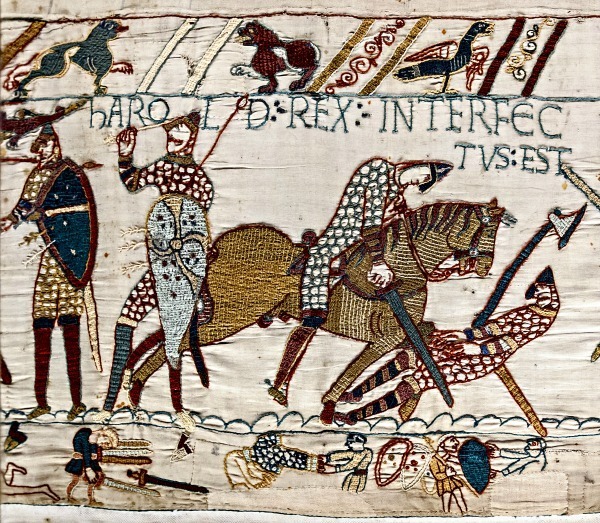 The Bayeaux Tapestries, which tell the story of the Norman conquest in 1066, show 2 Norman knights being rescued from the quicksand surrounding Mont Saint-Michel. During the Hundreds Years War, the English failed at multiple attempts to conquer the Mont. The Mont’s fortifications were used in reverse during the French Revolution when Mont St-Michel was transformed into a prison. There was no escaping for the political and clerical dissidents being held! At the end of the 19th century, the Abbey had to be restored and was finally declared a historical landmark. 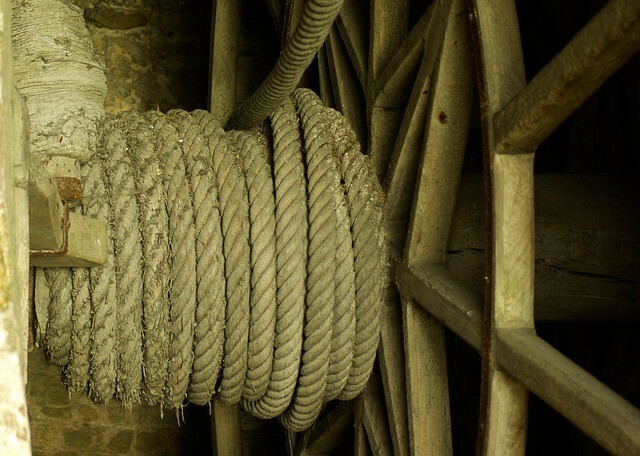 Prisoners were forced to be human hamsters and haul supplies and materials up the long ramp pulley system outside. This artifact remains in place for visitors to see a piece of the Mont’s prison history. In the 15th and 16th centuries, a medieval city gradually formed along the southeastern side of the rock, appearing to just barely cling to the lower outcroppings of the island. Today, visitors still enter in through the walled city gates and pass under the portcullis. With our guide, just before the portcullis at the entry. We visited in December and lucked out with a fairly mild December day! 15th and 16th-century buildings line the spiraling main street, leading to the steep steps up to Abbey. Mont Saint-Michel is so well-preserved. 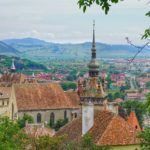 It’s easy to imagine a bustling village street with markets, free roaming animals, and locals going about daily chores. A birds-eye view of the main street leading to the Abbey. Did you know? 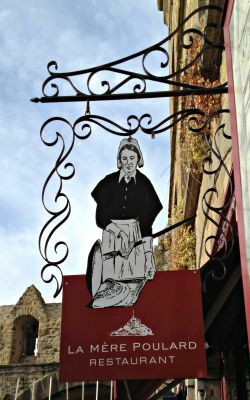 La Mere Poulard is a well-known restaurant in the walled city, founded by Annette Poulard around 1879. 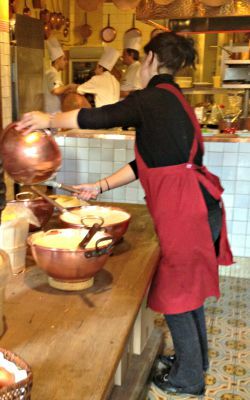 Its claim to fame is the gigantic omelets which are made in copper bowls and cooked over open fire. There’s also an autograph wall showing famous people, like Earnest Hemingway, who have dined at the restaurant. Truth be told, though, this restaurant is overpriced, with declining food reviews. You’re better off eating elsewhere. If you do decide to visit La Mere Poulard, be sure to make reservations. It books well in-advance. Today, just 50 people live on Mont Saint-Michel, including a small population of monks and nuns. The shops no longer house candle makers, apothecaries, and vendors selling cooked meats. Instead, they’re filled with souvenir bric-a-brac for the daily tourist visitors. 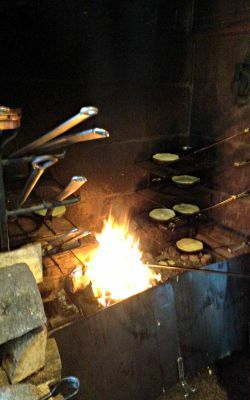 TIP: Buy some “Les Gallettes.” These local butter cookies are delicious! 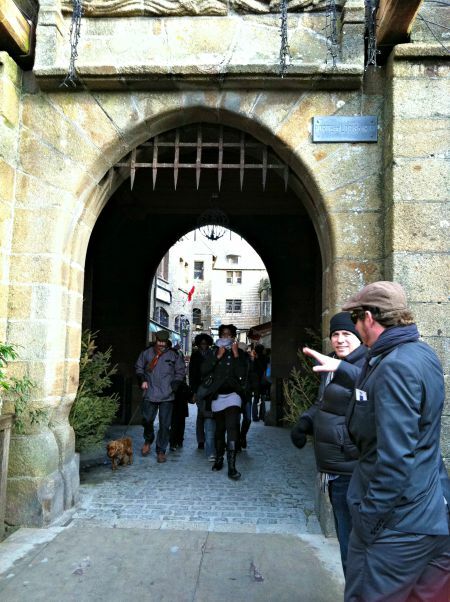 Research and book fantastic hotels near and on Mont Saint-Michel on TripAdvisor and Booking.com! 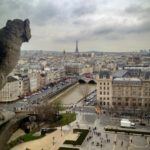 I stayed in Bayeux and was conveniently located near the train station and many of the area’s top sights! From the main street, take one of the smaller pathways leading to the ramparts for panoramic views of the water. 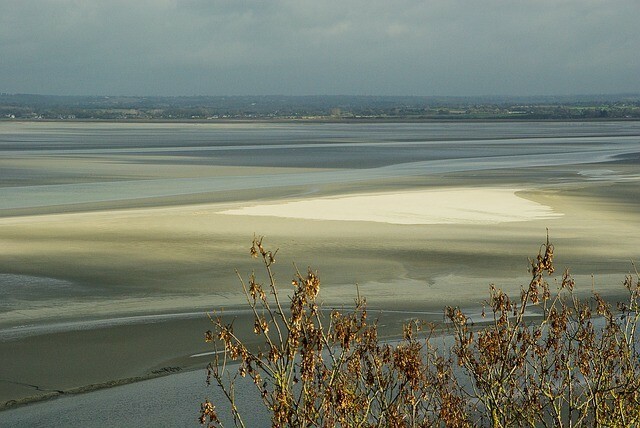 The Bay of Mont Saint-Michel boasts Europe’s highest and lowest tides. There can be up to a 50-foot difference between high and low tides! The tidal causeway leading from the mainland to the Mont would flood at times of high tide. There also used to be 2 parking lots within feet of Mont Saint-Michel’s entrance. These would flood during high tide. Signs posted warned drivers to make note of the high tide times, or else! A new light bridge replaced the tidal causeway as part of a damn project in the area. The new parking lots are 1.5 miles away, with regular shuttles bringing visitors across the bridge. Water flows underneath the bridge, except on super tides! At the end of the day, be sure to experience some (or all!) of the region’s specialties. When the tide goes out, the area’s salt marshes become grazing pastures for local sheep. Their meat, Agneau de pré-salé, is a local specialty because the sheep have been pre-flavored, so-to-speak, from their salty grazing pastures. 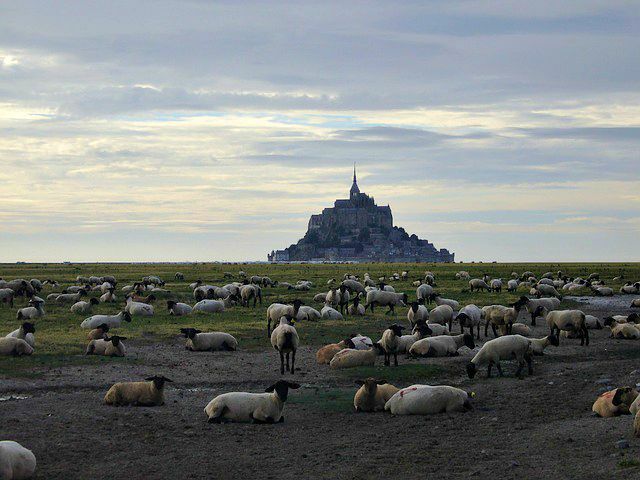 Local lambs grazing near Mont Saint-Michel. If lamb doesn’t suit your tastes, indulge in local seafood at its best! Shellfish, like oysters, scallops, clams and lobster will be served at restaurants throughout the region and paired with creme sauces and rich cheeses like Camembert. I had the best scallops of my life at a small restaurant in Bayeux, Normandy! Complete your culinary feast with some apple tart or sip on some Calvados, an apple liquor, perfect for cleansing your palette and digesting all the deliciousness of the night’s meal. 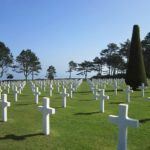 It’s simple to plan a couple day excursion to Normandy from Paris. We used Bayeux as a base to explore the area. Trains from Paris took about 2 1/2 hours. 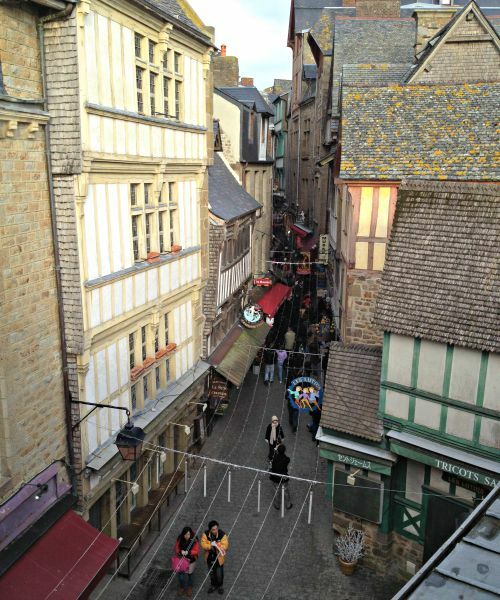 Once in Bayeux, you can walk or take a taxi to the city center where most hotels are located. Mont Saint-Michel can be visited throughout the year. It’s open every day, except January 1st and December 25th. During the winter off-season, the weather is chillier, but there are no crowds. Hours vary slightly by season. Entrance to the Abbey is 10 € for adults. Children under 18 are free. To explore the area, you’ll need a rental car or a guide. We had an incredible tour with Normandy Sightseeing Tours, who transported us to and from Mont Saint-Michel. There are no direct public transportation options. Trains from Paris Gare Montparnasse connect to a bus in Rennes to bring you to the Mont’s entrance. Walking is the only way to get around while on the Mont. 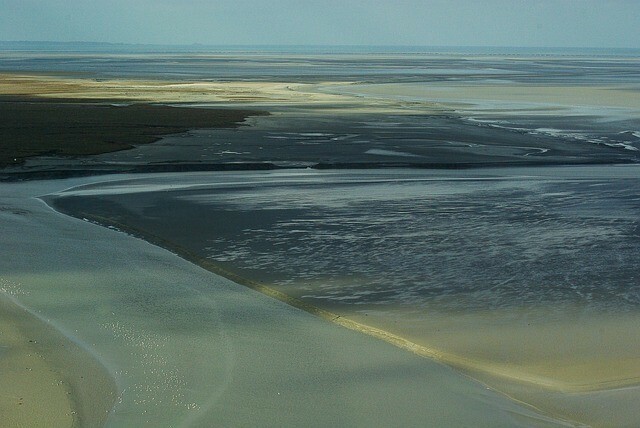 Mont Saint-Michel can be seen in 1 day. 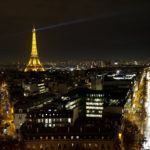 But, if you wanted to stay nearby or experience the Mont in the evening with fewer tourists, you can research and book a variety of hotel options. Otherwise, look for comfortable hotels in Bayeux or the surrounding towns. 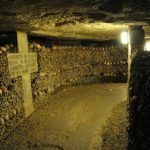 You’ll be centrally located and close to the numerous WW2 sites to see, as well as the famous Bayeux Tapestries. 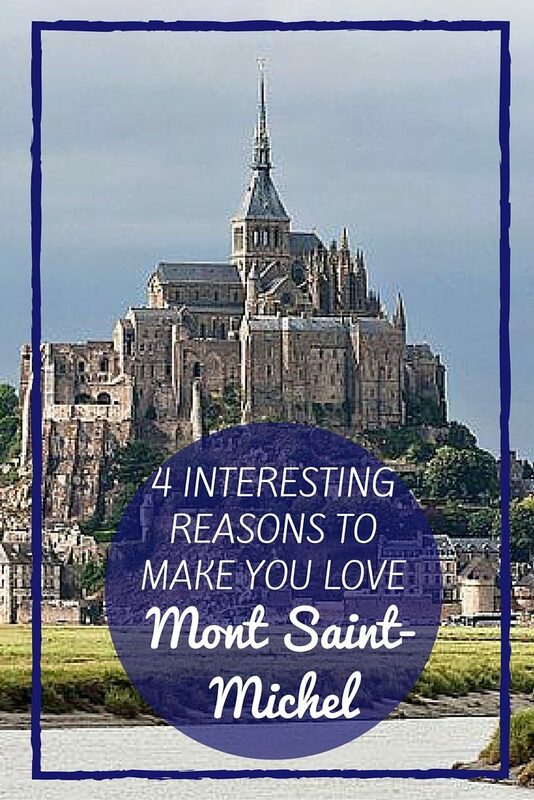 Have you been to Mont Saint-Michel? Would you like to visit? What an impressive beauty. And to think people made this. This article provides extensive tips. Thanks, Gemma! I couldn’t agree more. It’s massively impressive that people managed to build anything, let alone this incredible fortress and Abbey! It’s fascinating to me that only 50 people live there. 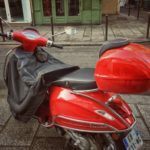 I think it would be fascinating to spend a few days there and get to know the locals and see the tourism cycles from their point of view. (PS Sad to hear that the giant omelettes aren’t a great deal or a great meal – I do love the concept.). Staying a few days for the purpose of seeing the Mont from the locals’ perspective would be so interesting! Also, it would be such a sight to stand on the ramparts at night when the tide completely surrounds the island. I have always wanted to visit here! It looks like such a magical place, like something out of a children’s fairytale. Although it’s sad to hear that the traditional shops now only sell souvenirs, I would much visit a traditional candle maker or apothecary rather than shop for postcards! Me too, Katja! It would only add to the charm if the shops still sold their medieval goods. Thanks for sharing your thoughts! Wow, beautiful photos! It looks like it’s a place out of a movie. I’ve just bookmarked your page. 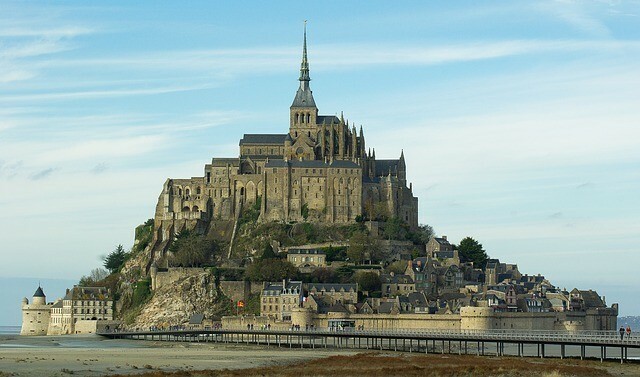 I’d love to visit Mont Saint Michel one day. So dramatic, right Amanda?! It’s easy to see why it was the inspiration behind Minas Tirith in Lord of the Rings: Return of the King. Wow, Mont Saint-Michel is like something out of a fantasy book. It’s so incredible looking – out there all on its own. I’d love to go there. Amazing pictures. Absolutely, Laura. Not only does it look like something out of a fantasy book, it has feels like you are stepping into a fairy tale! During our trip to Europe last year we almost made it to Mont Saint-Michel. It looks so impressive in all the pictures, I would have loved to see it for myself. It’s too bad all the shops are mostly for souvenirs now though. Hi Vicky and Buddy, hope you can make it on your next trip to Europe! Even having seen photos, it’s still spectacular when you see it in person! Very interesting to learn a bit more about the history–thanks for sharing! I’d love to check this out sometime–the scenery around there looks incredible! I agree, Jenna. 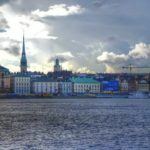 Learning the history or the backstory behind a place you travel to makes it feel that much more alive! Incredibly beautiful–and legends make it more interesting. I couldn’t agree more, Beverly! Thanks for sharing. This is has officially been added to my list of places to visit when I (eventually) get to Europe. Thanks for taking the time to give such an in-depth overview, especially of the history. I love the tidbit about it being used as a prison! So interesting! Thanks for sharing, Sky! When you know some of the history about a place you visit, you can imagine what it must have been like during that time. Definitely hope you can make it there someday! I love the history of Mont Saint-Michel. I would love to explore the city and see the sights. I love architecture and how it just kind of exists randomly in the middle of no where. I agree, Jennifer! It’s such an improbability that this place even exists. That’s part of what makes it such a sight! I didn’t know about this place and it looks amazing. It is great when you can find places that seem to have been locked in the past and really see what the world was like at another time. Will have to add this to my places to go next time I make it over to Europe. Thanks for sharing. Glad you found the post useful, Megan! If you can, visit in the off-season. There will be less crowds and you’ll get a better feel for what Mont Saint-Michel was like in the past. So unique, Sabine! It’s a wonder how it even exists. Thanks for sharing your thoughts! Thanks for your comments Hannah. 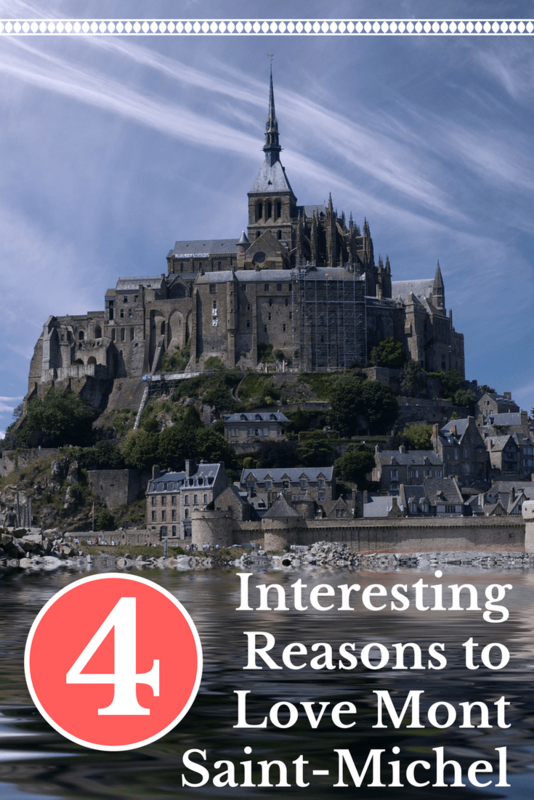 So glad you learned a few new things about Mont Saint-Michel.